Big John on beach patrol in Plymouth, Massachusetts. A popular police horse in the US who has twice beaten the odds to survive and is now on the road to recovery from a rare and debilitating hoof disorder. Big John on his first day of work for the Plymouth Police Force, with Tobias, last July. It was suggested that debridement on all four feet could help Big John, but the expensive procedure had only a 50% recovery rate. The Plymouth (Massachusetts) mounted unit set up a gofundme page to raise funds for the operation, but in the meantime a holistic equine practitioner offered to help Big John. “We never raised enough money for the procedure but that was actually a good thing because it gave time for the holistic supplements to do their work, and then a miracle happened – he started to get better,” said Sgt. Ray Reid, commander of the Plymouth Police Department’s mounted unit. Big John, a Belgian Draft – Clydesdale cross six-year-old, was also helped by local company SmartPac, which donated supplements for his treatment. “Once rotted hoofs, that were all gooey and spongy started to harden and then new growth began,” Reid said. But it wasn’t Big John’s first battle against the odds – once his story was made public his original owner stepped forward to reveal that as a foal, Big John had been saved from a PMU farm. The crowdfunding page has reached $2485 at the time of writing, and funds raised are being put towards the cost of supplements and care for Big John. 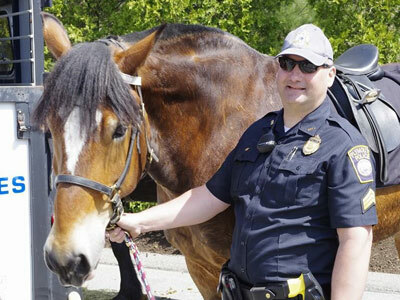 Big John has been a popular member of the mounted unit since he joined the force last May. “He took to the training quickly and was put out on patrol in July. He became everyone’s favorite instantly. The public, especially the children took to him without hesitation,” Reid said. “His calm demeanor for such a big animal is mesmerizing and disarming even to the most apprehensive of people. It became obvious that we stumbled onto something special because we noticed that kids who would have never have spoken to the Police suddenly and without any fear came up and wanted to talk about John the Police Horse. Pemphigus foliaceus (PF) is an autoimmune disorder in which the affected horse makes antibodies against their own skin. The exact cause remains unclear, although some experts believe black flies and sensitivity to Culicoides gnats may be to blame. Big John with Sgt. Ray Reid, commander of the Plymouth Police Department’s mounted unit.